Performed by Tim Curry About the Book Like a car alarm, bagpipe music, or a doorbell ringing in the middle of the night, hearing this all-new audio edition of The Bad Beginning will only upset you. 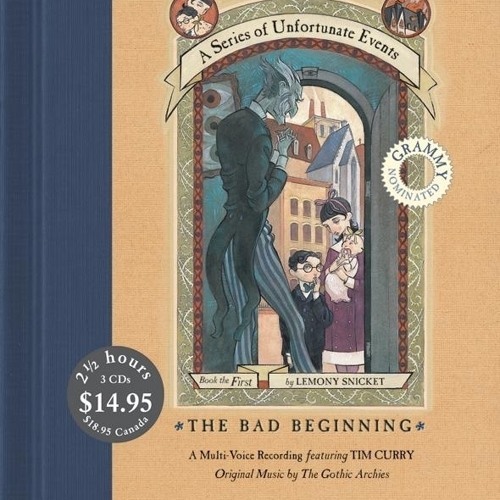 This unique multi-voice recording brings the first book in Lemony Snicket's alarming A Series of Unfortunate Events to such terrible life that no one should really have to experience it. Unless you have an ear for such ghastly details as a tragic fire, a nefarious villain, itchy clothing, and cold porridge for breakfast, all narrated in chilly detail by the distinguished, and disturbed, Tim Curry with a team of talented readers, you would be better off listening to something else.